Please note that we do require a credit card at the time of reserving your appointment. Le Mani is a fragrance-free environment out of concern for those that struggle with chemical sensitivities. We regularly run specials and appreciate you mentioning them when you book your treatment. We accept Visa and MasterCard. Personal checks are welcome. Le Mani has a 24-hour cancellation policy. Kindly note that a fee will be assessed for all no-show appointments or cancellations made less than 24 hours in advance. "Unbelievable! I have been going to La mani for a few years, and I love it. My skin looks wonderful and clear. What is so special about Gail? Well, her attention to detail and honesty about what I need for my skin. I always look and feel better when I leave-no matter how felt when I went in!!!!" 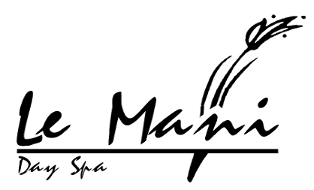 "I sometimes visit Le Mani Day Spa when I'm in town and it's always a treat. You can tell that Gail, the owner, really loves her work and she couldn't be more welcoming. I always feel taken care of, whether it's wrapped up in blankets during a facial, or when Gail made sure the receptionist found a gift certificate i'd lost. Le Mani is a warm and personal place with quality services." "I started going to Le Mani Day Spa using a Groupon Coupon back in July, 2010,and now go there faithfully! Teddi gives great microdermabrasion facials, and I also have been doing the micro current face lift sessions with her. My skin has never been in such great shape! Even though Teddi is the one who does my facials, the owner, Gail is always very friendly and welcoming to me when I enter the salon. Even though the travel time to get there is 40 minutes, it is well worth the trip! I highly recommend the spa and services they provide." "If you are looking to treat yourself to a facial, microdermabrasion or other treatment, Le Mani is the place to go! I have had problem skin since I was in high school and thank goodness I have Gail as my savior. Each visit she assesses what I need at that time and my skin is always transformed when I leave. The environment is so relaxing, calming and clean and the treatments are truly top notch. Gail is a wonderful person and treats everyone like a good friend. She stays on top of new treatments and is always so warm and inviting. I can't wait for my visits to Le Mani to de-stress and rejuvenate my skin! I can't say enough good things about this place...if you're looking for a relaxing spa experience, whether for a facial, microdermabrasion or a massage, Le Mani is the place to go!"